Last week I tried Pongal with brown rice and it came out very well, which made me think why not bisi bele bath with brown rice? Earlier I was very hesitant about using brown rice, wondering if we would like the taste or not. To my surprise my husband and myself liked it very much. I think this is one of the few things we both agree upon! What is bisi bele bath? It’s a traditional main course, rice dish from the Karnataka state of India, meaning hot lentil rice. Originally the preparation of this rice involves an elaborate procedure of preparing the bisi bele bath masala with fresh ingredients and spices. But like any other recipe which has quick short cuts to make life easier, this recipe can also be done in no time by buying store bought bisi bele bath powder. 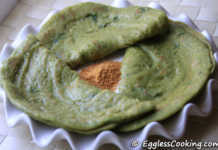 But in this blog post I have given the recipe to make the bisi bele bath masala powder at home itself. This powder can be made ahead of time and stored in the refrigerator for future use as well. If you are faced with time constraint you can buy the masala at your regular Indian grocery stores and use it in place of the powder I have used in this bisi bele bath recipe. I have used pressure cooker to make this bisibele bath recipe because cooking brown rice is made easier with the use of a pressure cooker to get the right consistency. You may try it in an electric cooker too but I haven’t tried it and hence can’t suggest any tips or tricks for the same. Brown rice when cooked has a rubbery (is it even a word?) texture. Or simply it is not as soft as its white counterpart. You feel very full after eating a cup of rice, as against wanting more after eating white rice. 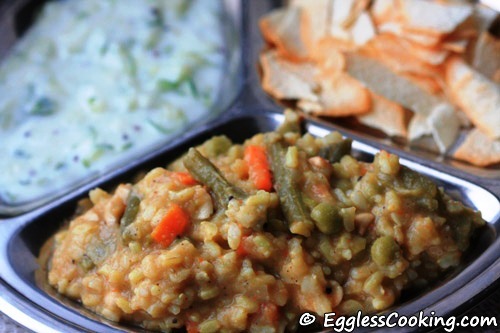 I made zucchini raitha to go with the bisi bele bath. That’s easy to prepare too. You can find other facts about brown rice here. Check here for more brown rice recipe ideas. 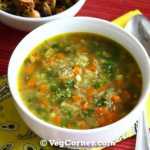 Wondering how to make bisi bele bath? Originally prepared using white rice, I have got here a healthy spin on the traditional bisi bele bath recipe using brown rice. Don’t worry, you will still like it. No compromise on the taste whatsoever! Wash the brown rice and toor daal and soak it together (also add turmeric powder) in warm water for at least 30 minutes (the longer the better). Soaking the brown rice in warm water activates more enzymes, which makes it possible to obtain a more complete amino acid profile. For 1 cup of rice and daal use 2 and 1/2 cups of water, so I used 3 and 1/4 cups of water. I did the soaking straightaway in a pressure cooker. After soaking, leave it for 5 whistles and transfer the cooker from the stove if cooking on an electric range, because the heat from the coil will continue the cooking process and you will end up scraping burnt rice from the bottom of the pressure cooker. Meanwhile prepare the masala powder, while the rice is cooking. 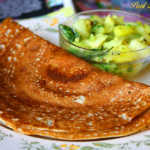 In a small frying pan add ghee, once it heats, fry (until golden brown) one by one the ingredients mentioned in the list. Once it cools, powder it in a blender/spice grinder. In a medium size pan add the 1/2 tablespoon of oil, once it heats add the mustard seeds, curry leaves (if using) and hing. Then fry the sliced onions. Add a pinch of salt, so that the onion cooks faster. Then add the vegetables and required amount of salt and let it cook for 5 minutes. Once it is half cooked add the tamarind paste and 1 and 1/2 cups of water and close the pan with the lid. Let it cook until the raw smell of tamarind leaves. Then add the masala powder and let it simmer for another 2 minutes. Alternatively you can do the entire step in a pressure cooker easily. That’s how I do it. I have a small pressure cooker. So as usual I do the tempering, fry the onions. Then I simply add the vegetables, salt, tamarind and water and close the cooker’s lid and leave it for only 1 whistle. If you are using an electric range be sure to transfer the cooker from the stove after turning off the stove, because the heat from the coil continues the cooking process and you would end up having mushy vegetables. After opening the lid, add the masala powder and let it simmer for 2 minutes. Then add the cooked rice and daal mixture to the vegetables gravy and mix it well. If you like you can add the 1/2 tablespoon of ghee or sesame oil now. If the rice looks a bit watery, don’t worry, it will thicken up. You can keep it on low heat for sometime and it will thicken up. On the other hand if it’s very thick add some warm water to loosen it. It’s very forgiving, so don’t worry. Wash the zucchini and grate it with the skin and place it in a bowl. Add the required amount of salt. In a small frying pan heat the oil, add the mustard seeds. Once it splutters add the sliced green chillies, hing and fry it. Add this to the zucchini and mix it well. Mix the yogurt to the zucchini when ready to serve. If you don’t have the time to prepare the bisi bele bath masala powder you can buy it. I’ve tried MTR brand and it’s good too. You could also buy the frozen Avial vegetables available in Indian grocery stores and save time chopping vegetables. I have pressure cookers in all size so I used one for cooking the vegetables and one for cooking rice/daal. You can also cook both in any vessel on stove top, but as far as I’ve read brown rice takes more time to cook like that. We don’t eat spicy food, so I used only 2 red chillies for the masala powder. The heat was very mild. If you prefer it more spicy use about 4-5 chillies. Next RecipeNot Your Usual Vegan Chocolate Cupcakes! I did just now.. Thanks a lot. Thanx for the wonderful brown rice bisibelebath.I tried it couple of days ago.It was rocking. My husband was totally blown away.I didn’t have zuchini that day, so made bottlegourd pachadi in the same way. Man,it was a rocking day. I tried brown rice pongal(both sweet & savory) also for Pongal festival & distributed to all my friends. Nobody could believe the wonderful taste. Thanx again for all the wonderful recipes. You’re most welcome, also thank you so much for your generous compliments. I too made brown rice sweet pongal for Pongal this year. 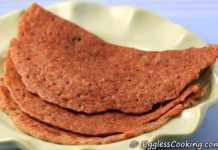 I used brown rice rava for it and couldn’t believe the awesome taste. 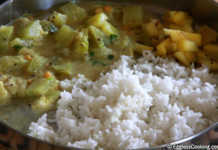 I too made bottle gourd raitha quite often. It’s very good right! Am posting a comment for the first time. Just wanted to say that you have wonderful site and love the way describe the procedure with most valued notes 🙂 . I tried your Bisebele Bath with brown rice and it turned out awsome! Hi Madhuri, thank you so much for your valuble feedback and for trying the dish as well. I’m glad that you liked it. You should also try the brown rice pongal then. sure will do…. i did make the guilt free chickpea roast… they were just fabulous!!! Thanks. Actually I’m going to post another brown rice recipe shortly. Thank you very much for the feedback Madhu. You should also try the pongal, if you don’t make it already. I am a little skeptical about brown rice . I have brown basmati rice for a long time …used them for tomato rice and was a disaster. 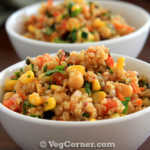 With so many comments and the assurance from you, I am going to buy the brown long grain rice and make Bisi Bele Bath. I’ve not used the brown basmati rice. But the long grain rice is good Cilantro. Use just 2 and 1/4 cups of water for 1 cup of rice, if you want to make fried rice or eat it with curries etc. If you want it nicely mashed for pongal, bisi bele bath etc use aroun 2 and 1/2 cups of water and leave it for 5-7 whistles. Bisi bele bhaath is such a favorite at my home, and I love making it with brown rice too. Gotta try your recipe sometime. I love the presentation, Madhuram. It was the first time I cooked Bise bele bath with brown rice and I don’t think I would be preparing it with white rice any more. I love bisi bele baath.. lovely idea to use brown rice.. looks delicious. bbb with brown rice? 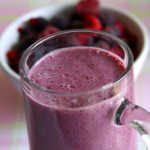 Now that’s interesting and looks so healthy and yummy! I haven’t used brown rice till now! May be time has come 🙂 ! Lovely Madhu.I too have bght brown rice thgh for another recipe I saw.I have never used it till now and thanks for the info in the post.Now I am ready to try it.The zucchini raita is yummy as well. I am very happy I came here late so that I could enjoy all the comments(till now) and your response to it. Thanks Sweatha. I’m also going to include it in our diet as often as possible. I don’t mind the comments Deepa, its not a problem at all. For the past week he is in the “Fruits-Nuts-Milk” phase. Luckily he still eats his broccoli and cauliflower. That was very quick Deepa. I’m happy you liked it. Welcome to my blog Sister Tinh. I’ve not used brown basmati rice yet. I’m referring to the brown long grain rice. Wish you a very happy new year too. It tasted good too Cham. looks so yum yum never tried brown rice will start using now. We also started quite recently only Rekha. I wish I had known about brown rice 2-3 years back Deepa. Even though we start with healthy foods for children, I think as they grow older, they get in control of what goes into their mouth. For instance, my son when he started eating solid foods, I introduced all vegetables. There used to be a time when he wouldn’t eat his rice without a generous cup of vegetables. He would eat any vegetable and especially broccoli, cauliflower and cabbage were his favorites. But I don’t know what happened now, the tables have turned. So I’m tricking him to eat his vegetables. Thanks for letting me know about the books. I’ll definitely check it out. nice try madhu. i have never tried brown rice. bisi bele looks yummm yumm. perfect comfort food. and reg malai koftas, yes, i used whole wheat multigrain bread. i always use only wheat bread. better than white. Thanks Mahimaa. I’m going to try the malai koftas very soon. Never tried anything with brown rice, this BBB maes me hunger…looks awesome!!! You should try it Priya. Oh Madhuram, this is superb. We have brown rice even for curd rice, never use white rice for anything these days, so this would be perfect for me. We are slowly making our transition Divya. Yeah, one pot dishs are best way to try brown rice, these day I have started making idlies and dosas with it.works of fine. Looks delicious, with chips and zucchini pachadi. I’ve made adais with it, but not idli/dosa yet. Will try that too. The zucchini pachadi goes well with vegetable pulav also.